What is it that fascinates kids so about fire trucks and firefighters? Being a former little girl, I was more interested in Barbies and baby dolls than trucks and fires; but as the mom of four boys, I know that many little boys love anything to do with firefighters. My ex-husband was a firefighter before we met, and my second son especially had an early childhood obsession with everything firefighter related. Lots & Lots of Fire Trucks lets kids get up close to firefighters and their equipment and is a Dove Family Approved series. I checked out Volumes 1 & 2 of Lots & Lots of Fire Trucks with my kids, and we found the DVDs both entertaining and informative. Volume 1 introduces you to different types of fire trucks, like pumper trucks, aerial trucks, and specialty trucks. Real-life firefighter Bryan “The Rat” Ratushniak takes you along on a road trip to fire stations across the country, and there’s lots of original sing-along music by James Coffey. Volume 2 talks about the history of fire trucks, the different jobs that firefighters do to fight a fire, and Fireman Jim talks about safety tips. We also received the 128-page full color Lots & Lots of Fire Trucks book, which is an oversized soft cover book full of information and lots of pictures. I really liked the layout of the book – there’s a great balance between factual information and photographs. Firefighter Joe is the book’s host, and kids learn all kinds of facts throughout the book. You’ll learn about the special clothing that firefighters wear and the different kinds of equipment firefighters use. There are sections on types of rescue vehicles, fire prevention and safety tips, classic fire house traditions, fires throughout history, lists of fire house museums and fire related websites, and lyrics to the songs in the DVDs. There are even fire house recipes! I especially like the safety tips provided in the book and DVDs. Two members of my extended family have lost their homes and possessions to fires; thankfully, everyone made it out of the houses safely both times. The DVDs and book discuss fire prevention, the importance of having an exit plan and practicing fire drills, calling 911, and stop-drop-and-roll. 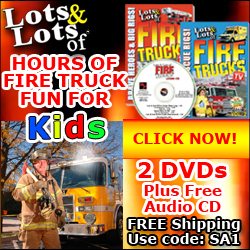 You can purchase the complete Lots & Lots of Fire Trucks set (both DVDs, the book, and a bonus audio CD with all the songs) from Marshall Publishing for $19.95. And get FREE First Class Shipping when you use the promo code TTB14! They have many other “Lots and Lots of” collections to choose from– trucks, trains, jets and planes, monster trucks, and even penguins! You can also subscribe to their YouTube channel for entertaining and educational video clips. TWO lucky Dividing by Zero readers are going to win the same Lots and Lots of Fire Trucks set that we received – both DVDs, the book, and the bonus audio CD. 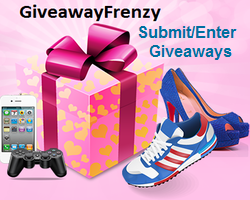 Get your entries in on the Giveaway Tools widget below – good luck! I received one or more of the products mentioned above for free using Tomoson.com. Regardless, I only recommend products or services I use personally and believe will be good for my readers. I am disclosing this in accordance with the Federal Trade Commissions 16 CFR, Part 255 Guides, Concerning the Use of Endorsements and Testimonials in Advertising. Dividing by Zero is not responsible for prize fulfillment; the sponsor is responsible for shipping the prizes to the winner’s valid address (no PO Boxes). Your information will not be sold or shared; it is used by the blog owner only and solely for verification/prize fulfillment. This entry was posted in Giveaways, Product Reviews and tagged Books, Giveaway, Kids, Movies, Product review by Tara.Bookmark the permalink. I like the Penguins and Happy Feet! So cute! kristiedonelson(at)gmail(dot)com Thank you! My sons would love the LOTS and LOTS of MONSTER TRUCKS 2 DVD SET. Lots and Lots of Firetrucks has to be my favorite. I’ve seen this on YouTube about 10 million times and so even if this wasn’t the one you are giving away it would be our favorite. Both of my grandsons are just mesmerized by firetrucks and this video which I still don’t own and I’m not really sure why. My favorite product is the Lots and Lots of Jets and Planes. My oldest son would LOVE Roaring Rockets! My little one ;loves looking at airplanes in the sky and pretending to zoom around like one, so I think that Lots and Lots of jets and planes would be a big hit here. I am looking forward to their release of Lots and Lots of Dancing Dolphins. I’ve kept my eye on this product for over a year now. We won the Penguin set and it is awesome! I love all of them. But my favorites are the animal dvds. I like the Lots and Lots of f JETS & PLANES set. I visited Marshall Publishing and my favorite are the Educational Historical Documentary DVDs. I would love to have them all. I also like the Lots and Lots of Trains DVD Set from Marshall Publishing. We have Lots and Lots of Monster Trucks, Trucks, and Trains – all vol. I. At the end of the dvd’s, there are ads for other DVD’s in their line. My son is dying to see Lots and Lots of Penguins! my daughter would love the penguin DVDs!! My kids would also love the Lots and Lots of Trains DVD set! I like the lots and lots of toy trains. I would love Lots and Lots of Monster Trucks for my son. I like the monster truck video’s, my boys would enjoy them. Lots and lots of trains! I really like the penguin set. That looks like something our whole family would enjoy.